Summer is in full swing and there are so many things going on it’s hard to keep up! As I sit at Nissan waiting for my oil to be changed I will update you all. Right now I am…nervous about a job interview tomorrow. I’m applying to our new school to work as a para professional. I am….glad that my son had a great time at sleep away camp last week. I am…. frustrated that my daughter can’t play by herself. I am her playmate. While I don’t mind it most of the time I need some time by self. I am….worried about my son. He wants to fly up to Indiana by himself to visit family. I am….excited! I starting selling Jamberry Nails. They are so fun!! I am….thinking of ways to keep my daughter busy this summer. I am….thankful that we have a buyer for our old house. The contract has been signed and hopefully everything will work out. I am….thinking I need to get busy and work on my blog! 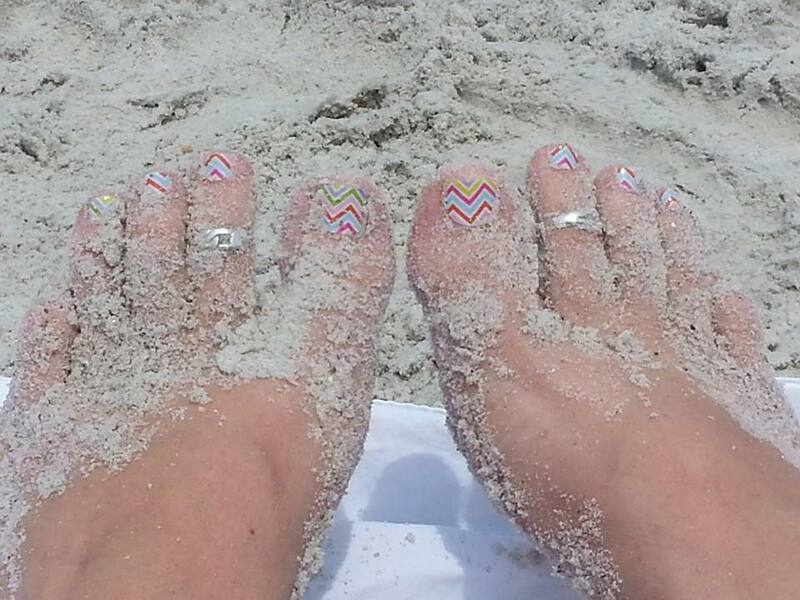 Right now I am wishing my toes were in the sand at the beach! And I am thinking I better stop daydreaming and get to work. Your toes are adorable! Are those Jamberry? I love your toes! I just got back from the beach myself. Love your toes in the sand! I haven’t tried Jamberry Nails. I have several friends who worked at the school as para pros. I hope you get that job! I am admiring those Jamberry nails on your toes and those toe rings. Good luck on the job situation. Glad to hear about the contract on your house. So glad you have so much to be glad about. Good luck with the job! A friend of mine recently started selling Jamberry. Love all of the cute designs they offer! Right now I am listening to the nightime sounds of my house and grateful for the moments of quiet that I can enjoy while everyone else is snuggled in bed. How exciting – good luck with the job interview! Woot congrats on selling your old home and on starting the Jamberry Nails sales. I love those things, they are so fun and easy to use. Right now we’re steeped in helping our daughter get ready for college in fall. So much to do and we’re all feeling a little overwhelmed. Good Luck with the sale of your home I hope it goes through smoothly. I so feel you on the constant playmate thing. My boys expect me to occupy them 24/7 on our summer road trip, and it is just too hard. I need some down time. Love your toes, so summery!